THE MANHATTAN PROJECT – Epik Fails of History! – And it changed EVERYTHING. It was one of those moments where the world would truly never be the same again. Politics suddenly had to cope with the fact that there was now a doomsday weapon that could obliterate a city in seconds and the very nature of war had to take on an all new meaning. For the first time in history, mankind was in charge of its destiny. We now had the untamed power of a million exploding suns at the press of a stupid little red button, and it’s an absolute miracle that we survived it. Obtaining nuclear power was basically the equivalent of Prometheus bringing the fire of Mount Olympus down to us unworthy mortals. Like the discovery of fire, we could also get burned by nuclear power. It serves an incredible source of renewable energy, with one of the most terrifying down-sides of any discovery known to man: radiation. Democritus, the ancient Greek philosopher, first came up with the concept of atoms as the building blocks of the universe, but it wasn’t till the 1600’s that Newton and other scientists began to really investigate this inner universe. The radioactive element Radium, and it’s rather adverse side effects, were first discovered by Madame Curry in 1898. Ernest Rutherford identified the phenomenon on a molecular level and realized that radioactive elements were an incredible source of untapped power. Then, as with practically every other invention in the history of mankind, it soon became apparent that atomic power could be weaponized. Because of course it was. After all, what’s the point of scientific progress if we can’t find more ways to murder each other? In 1914, H.G. Wells’s book “The World Set Free” featured atomic weapons and in 1924, Winston Churchill warned of the very real possibility. Then in 1938, Leo Szilard, a German scientist who had recently fled the Nazis, theorized that splitting an atom could lead to an incredible chain reaction. I.E. – It go boom. The following year, Albert Einstein himself sent a letter to President Franklin D. Roosevelt warning him of the potential threat. After being consulted on the possibility that Hitler could build an atom bomb, the United States decided to pursue the study of weaponized Uranium in order to beat the Nazis to it. Thus the Manhattan Project was born. It turned out to be the only remotely successful pursuit of an atomic bomb throughout all of WWII. It turns out that the Nazis were way too busy waging war on multiple fronts to pour any significant resources into atomic research, the British were too busy fighting off the Nazis, and the French were too busy being occupied by the Nazis. Following Japan’s devastating attack on Pearl Harbor on December 7th, 1941 – Roosevelt managed to get all the support and funding he needed for the project – an insane $2 billion. That’s TWO BILLION DOLLARS in 1940’s money! FDR appointed Vannevar Bush as the head of research and development. Teams from Berkley, Princeton and Chicago began to investigate different methods of uranium isotope separation. They put together the MAUD report: a top secret committee of nuclear scientists dedicated to creating a bomb utilizing radioactive material. In 1942, General Leslie R. Groves, (the engineer who created the Pentagon) took command of the operation and decided to make every decision based on building a bomb as fast as possible, with little regard to the typical scientific caution. The development of the atomic bomb was now being overseen by high ranking military officials who didn’t know the first thing about scientific research, much less nuclear theory… which complicated things. Oak Ridge, Tennessee (off the Clinch River) – became the Manhattan Engineering District aka Site X. Thousands were employed, but secrecy was so tight that many people working on it didn’t even know what they were working on. This however didn’t stop a number of Soviet spies from infiltrating and obtaining enough classified information to eventually develop their own nuclear program (more on that later). Plutonium was starting to look promising and in 1943 R and D was funneled to Site Y for testing: Los Alamos, New Mexico. Bomb testing preparations at Los Alamos were headed by J. Robert Oppenheimer. Unlike General Groves, Oppenheimer was a very different kind of man: a thoughtful, sensitive and philosophical chain-smoker. Throughout his life, Oppenheimer was harassed by the FBI for alleged communist ties, but government officials came to the conclusion that they could not complete the project without him. July 16, 1945 – 5:30 AM – the Atomic Age began in a blazing nuclear fireball, unleashing 18.6 kilotons of radioactive power. A blinding flash of light, brighter than a dozen suns lit up the sky and shock-wave of searing heat burst forth, obliterating everything within its radius for miles. A column of debris bloomed into an ominous mushroom cloud of fallout particles. The test could be seen from 250 miles away and had the yield of 5,000 tons of TNT! In 1945, WWII had been ravaging Europe and the Pacific Theater for a decade. The Allied Forces had finally crushed Adolf Hitler’s world-conquering ambitions (and turned Berlin into a parking lot), but the Japanese Empire wouldn’t go down so easily. Even though defeat was inevitable, the Japanese were willing to fight to the bitter end and the staggering death tolls were rising by the day. The Allies had cornered Japan, cutting off their supply lines and firebombing the islands relentlessly, killing over 10,000 and injuring over a million civilians in Tokyo. A second air raid killed 83,000. Hundreds of thousands had been killed on both sides and the toll was rising. Something had to be done. President Harry Truman was getting nervous. Now that the war was coming to an end, a new conflict was shaping up between the Soviet Union and the newly formed United Nations. Truman was determined to defeat Japan before the Soviets stepped in and took over. On May 31, 1945 – an Interim Committee meeting was held to discuss the situation, whether or not to use their new weapon to force Japan’s surrender, but more importantly what future implications it would have on the world at large. They came to a consensus that if the bomb was used, it should be kept secret until such time. July 24, 1945 – the Potsdam Conference: President Truman and British Prime Minister Winston Churchill meet with the Soviet Premiere, Joseph Stalin. When Truman revealed to Stalin that they’d been working on a top secret weapon of mass destruction, Stalin was visibly unimpressed by the revelation, because as it turns out, he already knew everything about it thanks to his spy network within the Manhattan Project. (Like the rebels stealing the plans to the Death Star in “Rogue One”.) Stalin simply told him that he was glad to hear it and hoped that it came in handy against the Japanese. The Death Star: the sci-fi equivalent of the Manhattan Project. According to the US’s projections, an Allied victory was inevitable, but it could cost the lives of thousands of American soldiers. Truman decided to give the order for the nuclear option. There were 5 possible targets: all civilian cities. Kyoto was dismissed for its cultural and historical significance. Before the attack, it was decided that two bombs would be dropped, one plutonium, one uranium, just to see what would happen. August 6th, 1945: a B-29 bomber, the Enola Gay, flew over Hiroshima at 31,000 feet. At approximately 8:15 am the plane dropped a 9,700-pound uranium bomb: Little Boy. The atomic bomb detonated at 1,900 feet instantly killing 70,000 people in a blinding flash. Men, women, children. Civilians. Those unlucky enough to survive the initial blast slowly died of radiation poisoning over the next few years. The American public wasn’t even informed until hours after Hiroshima was nothing more than a crater. Then before Japan could even react, much less surrender, Russia declared war – the very thing America wanted to avoid. In the wake of Hiroshima, the US called for Japan’s immediate unconditional surrender. They were preparred to surrender with some terms, but the US was unwilling to negotiate. The Japanese responded with “Mokusatsu (suru)” meaning ‘We’ll wait in silence until we can speak with wisdom’. This was then mistranslated as ‘No comment’. Truman took that as a sign that they needed further convincing. So on August 9th, at 11 am, before the Japanese could come to a consensus in the chaotic aftermath of the atomic attack, a second bomb, the 10,000 pound plutonium-charged Fat Man was dropped on an unsuspecting populace. The original target was the Kokura Arsenal, but there was heavy cloud coverage and low visibility and their backup plan, Niigata, was too far away, so they settled with Nagasaki. St. Mary’s Urakami Cathedral, the largest Christian church in East Asia was chosen as ground zero. The bomb completely obliterated the city, vaporizing 40,000 people, eventually killing 100,000 more. Almost all of the casualties were women, children and elderly non-combatants. The death toll gradually topped well over 200,000 over the next five years thanks to all the radioactive ash in the air. To put further insult to injury, Truman sent in a research team under the guise of aide. The Atomic Bomb Casualty Commission was actually sent in to study the effects of nuclear fallout rather than to treat the victims. August 15th, 1945 – Emperor Hirohito announces Japan’s surrender. August 29th, 1949 – The Soviet Union successfully tests it’s first atomic bomb. The Cold War between the US and USSR lasted from 1947-1991: during that time there were 2,053 nuclear detonation tests. 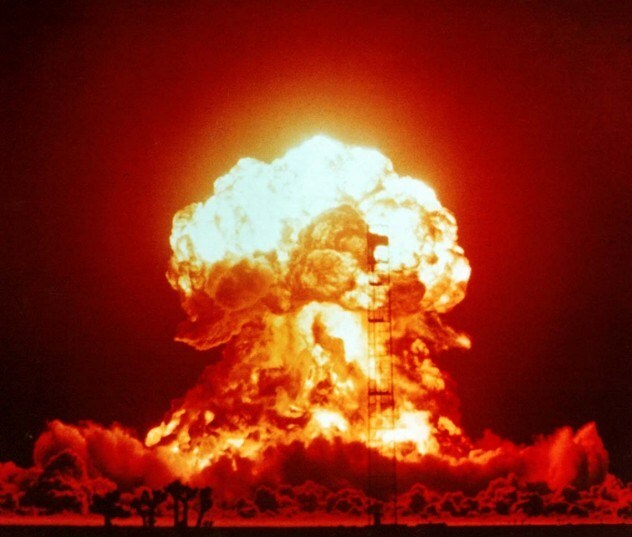 In 1952, the United States tested the first Hydrogen Bomb – a weapon 1,000x more devestating. In 1961, the Soviets unleash the Tsar Bomba – the largest thermonuclear device ever detonated with a whopping: 50 Megaton yield and a destructive radius of 560 miles! To this day, it is still the most powerful man-made explosion. Even today, with a good 7,000+ strategic nuclear warheads, the US still has the power to wipe out the human race at least 5 times over. Turns out that even a ‘small’ nuclear war between two regions like India and Pakistan could result in such catastrophic environmental conditions that could lead to the extermination of most life on the planet. Firestorms would blast 5 million TONS of ash into the atmosphere, altering the global temperature, drastically changing the weather and inevitably causing ecological disasters and droughts world wide. The US and Russia finally agreed on the MAD doctrine of ‘Mutually Assured Destruction’, meaning that if either side were to attack the other, they’d surely be destroyed by the other. So it was kind of a paradox. What happens when the irresistible force meets the immovable object? You can help support “Epik Fails of History” by either donating to our Patreon, following us on Twitter or Liking and Sharing us on Facebook!